Product news, industry trends, company updates, events and training courses ... get the latest of everything COPA-DATA, delivered to your inbox. Missed an issue? Just browse our archive! 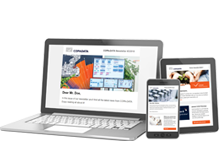 Four times per year, this newsletter provides extensive information about COPA-DATA, our products, services, customers, partners, markets, R&D projects, events and more. Short information snippets, clearly bundled up, ensure a fast, informative update. The Automotive Industry is recognized as one of the most efficient industries in the world. How can intelligent HMI/SCADA applications, together with other components of production, lead the way to even more efficiency and higher quality? Bernd Wimmer, Industry Manager Automotive at COPA-DATA answers these and further questions in his newsletter. Stay updated on all topics that move the energy industry - from GOOSE and IEC 61850 applications over smart grid to renewable energy. Jürgen Resch, COPA-DATA Industry Manager Energy keeps you in the loop. Emilian Axinia, our Industry Manger Food & Beverage treats concrete challenges and approaches to solutions in F&B production in his newsletter. Content are topics such as introducing KPIs, reducing consumption or controlling critical processes with HMI/SCADA applications. The Pharmaceutical Industry is facing great challenges. Increase production efficiency and at the same time guarantee maximum product safety and comply with regulations. Our Industry Manager Pharmaceutical at COPA-DATA presents possible solutions to industry moving topics in his newsletter.